We’ve had a World Series for just over 100 years now. In all that time game seven has been the ultimate finale of a season. There were a handful of Series’ that were a best of nine, but none of them ever went nine. So game seven remains the capstone of a baseball season. In all those 100 plus years, there have been exactly nine times that a pitcher has thrown a complete game shutout. Here’s some information about them. 1. Only twice has the pitcher gone on to the Hall of Fame. Dizzy Dean did it in 1934 and Sandy Koufax in 1965. 2. Most of the games have been blowouts. Five of them were won by scores of 5-0 or worse. 3. The other four have been won by scores of 2-0 (1955), 1-0 (1962), 2-0 (1965), and 1-0 (1991). 4. Only one, 1991, went into extra innings, with the winning run occurring in the 10th inning. 5. Much of Jack Morris’ Hall of Fame defense lies in that 1991 game seven. 6. The biggest blowouts were both 11-0 (1934 and 1985). 7. The initial game seven complete game shutout was by Babe Adams for Pittsburgh in 1909. It was also the first time that a seven game series went seven games. I did a post on 1991 a long time ago. Over the next few posts I want to look at the other three close games. They are in many ways, the ultimate nail-biters. This marks the 755th time I’ve sat down, typed up something, and not thrown it away. Normally, I would celebrate 750 comments, but 755 is a baseball number, 750 isn’t. The number 755 commemorates the home run total of Henry Aaron and thus seems to me to be much more appropriate a number to commemorate. Back when I began typing these in November 2009 I thought I knew a lot about baseball. Turns out that I was wrong. My knowledge was pretty good, but nothing like what it is now. And there is more than one reason for that. First, I’ve done a great deal of research and have been stunned by how much I’ve learned. But as importantly as that is how much I’ve learned from the people who read me and comment. I’m forever finding some nugget that I didn’t know and that leads to more research and more knowledge. Equally important are the other bloggers that I read with frequency. It’s astounding how much info is out there and how much the people I read know. Again that leads to more research and more knowledge on my part. I have to admit that over the period from November 2009 through today I’m certain I’ve gained more wisdom than I’ve ever imparted. So a thank you to people who read this and comment. A thank you to the people I read. May each of us continue and may each of us push the frontiers of knowledge outward. I saw over the weekend that Frank Torre died. Today he’s most famous as Joe’s big brother. That’s kind of a shame because he was a pretty good ballplayer in his own right (but his younger brother was better). I remember him from the late 1950s Milwaukee Braves. He was a tall first baseman who carried an enormous glove. There was a joke going around that Red Schoendienst (the Braves second baseman) covered the thirty feet closest to second, Torre took the thirty feet closest to first, and Torre’s glove covered the middle thirty feet between first and second. He was a very good first baseman, not Keith Hernandez good, but still darned good. He didn’t hit a lot; going .273 with 13 home runs for his career, although in 1957 he scored six runs in a game. It was an era of big hulking first basemen who hit the ball a long way and did an adequate job at first. Milwaukee’s answer to that was Joe Adcock. In 1957 Adcock got hurt and Torre did most of the first base work late in the season. He got into the World Series and hit .300 with two home runs (only Henry Aaron had more). The Braves won and got back to the Series in ’58. They lost and Torre did poorly with the bat (but still played well at first). He ended up spending a lot of time coming into games late to spell Adcock when the Braves wanted a good defense to protect a lead. He ended up playing a couple of years in Philadelphia. He hit .300 one year, but still had no power. His last year was 1963 and he was through by then. He was 31. I lost track of him after that until he resurfaced with the heart problems in 1996. It made a great story with him in a hospital bed, his younger brother managing his old nemesis team the Yankees against his old team the Braves. But after New York won, he slipped back into obscurity. I always liked that 1957-’59 Braves team. I think it’s one of the great teams ever and it gets totally lost behind the New York teams. 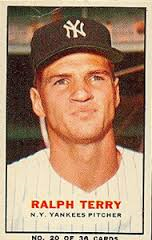 Torre was a major member of that team and I always kind of liked him (although Spahn, Burdette, Aaron, and Mathews were the guys I liked best). 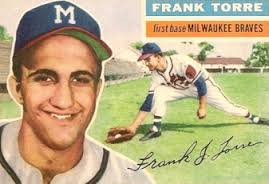 RIP, Frank, you will be missed by the baseball community. By now anyone reading this knows about the crisis occurring in the National Football League. I don’t intend to comment on the specifics of the problem, I write about baseball not football. But it’s the kind of crisis that can hit baseball at any time. Fortunately, Major League Baseball has managed, to some extent, to get something right when it comes to personal conduct crises. Admittedly, it was forced on them, but they did take action. One of the complaints I’ve had for years about discipline in sports is the absolutely arbitrary nature of it. One guy gets picked up for drunk driving and loses 10 games. Another guy does the same thing and gets 15 games. Huh? And before anyone says anything, I made those numbers up for example purposes. But if you look through sport you’ll find this kind of thing happens a lot (the NCAA is particularly bad about it). It seems to me that an easy way to stop a lot of this nonsense is for the owners and players to sit down and negotiate definable punishments for certain actions and put them in the collective bargaining agreement. MLB has done this with steroids (which is what I mean by getting something right after being forced to deal with it) and it seems to me that they could do it for other things like drunk driving, recreational drugs, prescription drugs, beating up your wife, fighting on or off the field, etc. This way the owners, the union, and the players know exactly the consequences for specific actions. Obviously there has to be nuances to it such as whether the player is only charged, or being tired, or actually convicted. Also the number of offenses of the same type, pattern of behavior, etc would need to be considered. But those can be addressed in the negotiations leading up to the agreement. Among other benefits the players know exactly what certain actions will cost them in playing time and in the pocketbook. And no set monetary amounts, make it a specific percentage of their paycheck. The idea of fining a guy $5000 when he makes $50,000 per at bat is just plain silly. The union will be off the hook also. The union looked awful when it appeared to defend the right of players to take steroids. It was their job to defend them, but looked terrible to the public. This way the union can say this action is wrong and the punishment is laid out in the agreement. And the owners get to say we’ve moved to solve these problems. To be absolutely clear, this will not change the behavior of players, but it should help both MLB and the union by giving them consistency in dealing with these type problems. I know it’s not a panacea, but I think it will go a long way to help the players, the union, and the owners keep from looking clueless when a personal action crisis comes up. We all know one is coming (and surely more than one). It is in the best interest of the sport to develop a plan to deal with it when it comes. This could be a start, but only a start. 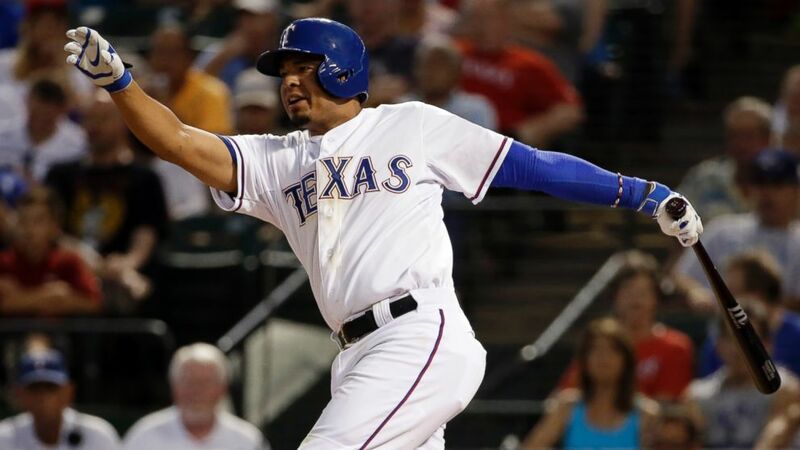 According to ABC News (abcnews.go.com/Sports) last night the Texas Rangers stuck rookie Guilder Rodriguez at second base. “So what?” you ask. According to the story Rodriguez spent ten years in the minor leagues and played 1095 games in them. That number is an all-time record. No one else ever played 1095 games in the modern minors (since the advent of the farm system) without making it to the Major Leagues. He went 0-3 with a walk and played well at second. Congratulations to the Rangers for finally giving him a chance. And congratulations to Rodriguez for having more loyalty to a game than most of us. Welcome to the Big Leagues, Guilder Rodriguez. In his Pulitzer Prize winning book on the American Civil War The Killer Angels, author Michael Shaara comments that there’s nothing quite so much like God as a general on a battlefield. Maybe. 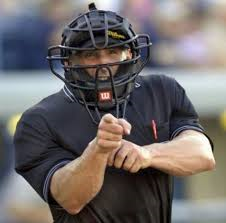 But you know, an umpire on a baseball diamond (especially before replay) is damned close. When I started to do a personal Hall of Fame I decided to add contributors to the Hall and that included umpires. Of course then I realized that I knew absolutely nothing about 19th Century umpires other than a smattering of names. So I’ve begun some research into umpiring. Here’s a short look at a few things I’ve found. 1. Initially umpires sat (literally sat) in a chair to the side of the diamond and were asked to render “judgments” on plays if asked by either team. In other words they weren’t involved in balls and strikes or close plays at first or anything like that on a regular basis. I think that was the thing that got my attention most. Apparently the original teams never anticipated the modern umpire. 2. 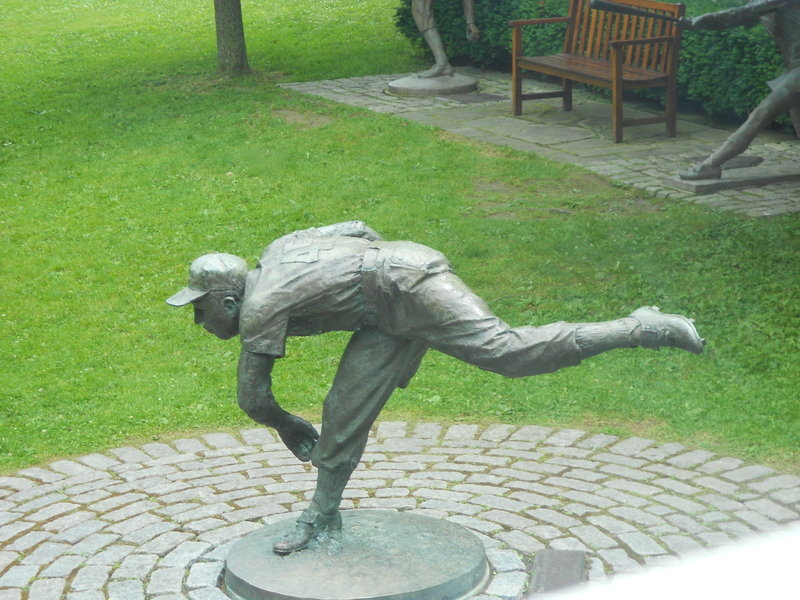 During the early years the umpire, once it was decided he would do such things as call balls and strikes, stood off to the side of home plate. That made it difficult to determine if a ball went over the plate, especially the corners, but it was easy to determine if it was high or low. This was the reason that early players were allowed to call for a high or low ball from the pitcher. If they pitcher was supposed to throw a high one and tossed a low one, it counted as a ball without reference to whether it went over the plate or not. I always found that to be a silly rule, but now it makes a little more sense. 3. Early umps tended to be locals who knew and understood the game. Each home team was supposed to supply an umpire with the visitors getting something like veto rights if the guy was a known “homer.” Occasionally there were fights over the use of a particular umpire and sometimes a team would refuse to play if a certain ump was used. 4. As the 19th Century came to a close, more and more umpires were retired players or players who were hurt. There doesn’t seem to be an actual rule disqualifying an umpire from calling a game involving a team he was playing for, but it was discouraged. Actually a handful of players were considered so honest that they were used to ump games for their own teams (try that today). 5. The American Association began to pay ($140 per month) umpires in 1882, and had the league determine which umps would cover which games, thus establishing the first “modern” umpiring set up. The National League had a group of acceptable umpires, but teams were allowed to pick from them. 6. In that same year Richard Higham was banned for advising gamblers on which games to bet on when he was umpiring. 7. By 1901 the use of two umpires was becoming more widespread. Bob Emslie began umpiring in 1890 as a solo umpire and retired in 1924 when multiple umpires was the norm. The Player’s League used two umpires in 1890 and the NL encouraged it afterwards, but because team owners had to bear the expense of paying the umps, most teams still only used one. In 1902 the two umpire rule went into effect in the AL. The NL came along. 8 In 1933 the third umpire became standard in both leagues. That system was used sporadically prior to 1933, for instance in World Series or critical games, but was unusual prior to ’33. 9. In 1952 the current four man crew was established for all games, not just the World Series. 10. In 1963 the National League Umpires Association, the first umpires union, was formed. The American League umpires followed later. 11. There are 10 umpires in the Hall of Fame. 12. In 1885 Spaulding’s sporting goods company advertised for what is apparently the first umpire’s indicator (the clicker). I have a favorite niece that I adore. She’s bright, charming, whip smart, funny, and very good at her job. But she’s really into all this business jargon that sometimes confuses me. She’s worked with a job counselor, done all sorts of community service (which isn’t bad by any means), made sure her name is out there. She calls it “branding”, as in “establishing her brand” for prospective employers. When she says that, I always have images of John Wayne, Montgomery Clift, Paul Fix, and Walter Brennan leading a roundup and branding cattle in the 1940s classic Hollywood Western Red River. In many ways Charles Comiskey is a brand (in the sense my niece uses the word), usually seen as a bad one. The other day I put him in my personal Hall of Fame and got a lot of comments. Some of them didn’t show up on the post (see the post directly below this one) but came in emails directly to me. Uniformly they thought Comiskey was a scumbag and probably shouldn’t be allowed near sane people or little children. Most, however, acknowledged that Comiskey had a great impact on baseball. Kortas put it best when he mentioned he’d hold his nose but vote to let Comiskey into the Hall of Fame. That sums up my view of Comiskey. But all of us, aware of what was to happen in 1919 have rebranded him from his status in 1907. Between 1882, his rookie year, and 1901 the first year of the American League, Comiskey is one of the more important people in baseball. He joins the St. Louis Browns (now the Cardinals, not the Baltimore Orioles) in 1882 and by 1883 he is a player-manager (after the other guy is fired). In 1884 he again takes over as manager after the previous manager leaves and remains the manager through 1889 when Comiskey joins the Players League. So from the beginning he’s seen as both a fine baseball mind (and don’t forget credit for inventing the first baseman playing off the bag) and a good businessman (1880s managers also did a lot of general manager type stuff like booking hotels and seeing that uniforms were clean). In joining the Player’s League he indicated a devotion to the Brotherhood, making him an early advocate of player’s rights. Although it’s true that Ban Johnson was front and center in forming the American League in 1901, Comiskey stood at his right hand. He’d joined Johnson in the 1890s looking to have a team of his own and looking to move into the Major Leagues (of which there was only the National League). With no ownership openings available, Comiskey ended up controlling a team in the Western League and both encouraged and joined Johnson in taking that league “Major” in 1901 under the name American League. He had a strong team and in 1901 picked up the first ever AL pennant. A strong team in Chicago gave the AL instant recognition as on par with the NL (although I’ll be the first to admit that Boston winning the 1903 World Series was surely more significant in granting parity between the two leagues). In 1906 his White Stockings won again. To this point a career to applaud. But Comiskey’s career didn’t end in 1907. We all know what happened in 1919 (something 1907 contemporaries didn’t) and it destroyed the Comiskey Brand for anyone who is a baseball fan. But in defense of Comiskey (and, no, I can’t believe that I actually typed those words) he was a fairly typical owner of his era. Guys like Soden whose pennant winning Beaneaters left for the AL in droves, or the Robison brothers who destroyed the Cleveland Spiders weren’t significantly worse than Comiskey when it came to treatment of their players. There was one significant difference, Comiskey was an ex-player and he knew what it was like to be a player and be treated badly by ownership. There’s a wonderful moment in the movie Field of Dreams when Shoeless Joe states, “Shoot, I’d a played for nothing.” I’m certain Comiskey would have been more than willing to let him. But so would the other owners of the day and, frankly so would the current set of owners. So Comiskey isn’t really different from his contemporary colleagues, it’s just that he’s a degree worse. And all of that was unknown in 1907, at least to most people (and I admit I have no idea how badly he treated the 1906 squad, but I doubt it was significantly better). The Comiskey Brand was still viewed with the aura of good player, great manager, innovator, winning owner. We know there was another side, but the rebranding of Charles Comiskey didn’t come until the 1920s. It’s time for my monthly foray into the mind of Baseball Writers in the early 20th Century. I’m hoping to determine, at least to my own satisfaction, what a Hall of Fame established in 1901 rather than the mid 1930s would look like. Specifically I’m wondering how much it would differ from the current Hall. Here’s the Class of 1907, a class that adds a pair of greats that were overlooked for years. OK, that’s the right one. 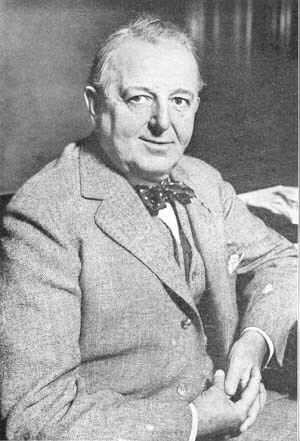 Charles Comiskey was a player, manager, and owner who changed the game. As a stellar first baseman he invented playing off the bag thus cutting down the “hole” between first and second. As manager of the St. Louis Browns in the 1880s he had all his infielders follow suit thus cutting down on the number of hits available. His team won four consecutive pennants and four consecutive post season tournaments, winning one of them and tying a second. He helped found the American League by creating a team in Chicago. 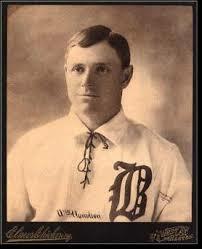 His “White Stockings” won the first ever American League pennant and in 1906 won the third World Series. William “Slidin’ Billy” Hamilton is the career leader in stolen bases, his totals peaking at 111 in both 1889 and 1891. His career average of .344 is among the highest in the 19th Century. In 1594 games he scored 1697 runs, with 198 in 1894 being the all time record. Amos Rusie was a strikeout machine between 1889 and 1901 he struck out 1950 men, with a high of 341 in 1890 for New York. In 10 seasons he won five strikeout titles and led the National League in wins in 1894. His 246 wins are among the highest in National League history. And now the commentary you’ve all been waiting for all this time. 1. Comiskey? It is incredibly difficult to like Comiskey, but this isn’t about likeability. His contributions to the game are significant. We was a successful manager with an very impressive record and winning percentage (.608). In 12 years managing he finished below fourth twice (the last two seasons). He was considered an excellent first baseman for his era, but didn’t hit much. The info about inventing playing off first was around in 1906. By that point there were already disputes about Comiskey inventing the action. Frankly, I doubt he did, but he was getting at least a little credit for it so I mentioned it. Ban Johnson is the primary mover in creating the American League, but Comiskey is a close second. He deserves credit for that. He was also one of John Montgomery Ward’s earliest followers in the Brotherhood (which makes his later career as a parsimonious owner even more awful). The early teams he owned were good and won it all in 1906 (and in 1901 when there was no World Series). My son suggested I hold until after the 1906 World Series to add Comiskey to my Hall. Considering the positive press he would have gotten in late 1906 and early 1907 that was a really great idea (and my son gets the credit for it). We do have to remember that the anti-Comiskey feelings most of us have relate to a much later time in his ownership. 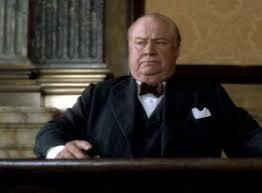 And BTW, doesn’t Clifton James look like what you want Comiskey to have looked like? 2. Billy Hamilton is a classic case of why I’m doing this entire exercise. He died in 1940 and made the Hall of Fame in 1961 (Vets Committee). Are you kidding me? Hamilton was one of the greatest players of the 19th Century, but by 1935, 1936, 1937, etc. had utterly disappeared from memory. I submit that in 1907 he would still be well-remembered and get a free pass into any Baseball Hall of Fame existing then. His games to run ratio was known as was his average. Having said that, as far as I can tell, there is almost no reference about how unusual it was to have fewer games played than runs scored. As mentioned in last month’s My Own Little Hall of Fame post Pete Browning was considered the man with the highest batting average in the 19th Century for much of the 20th Century. Baseball Reference.com, however, gives that title to Hamilton. The 1907 crowd most likely would accept a Browning answer as correct. And finally the way stolen bases were counted differed from the modern definition for most of Hamilton’s career. 3. Amos Rusie was the 19th Century’s version of Nolan Ryan. A lot of wins, a lot of losses, a lot of walks, and a heck of a lot of strikeouts. His career was short, but he successfully got through the mine field of changing the pitching distance and adding a mound to prove he could pitch at both distances and with different motions. He took even longer than Hamilton to make the Hall of Fame (1977), and I can’t imagine that would be true if there was a Hall of Fame set up within 10 years of his retirement, although I’d guess that Hamilton would gain the greater share of the vote total (but that’s only a guess). 4. Again no fourth or fifth player? Nope. I’ve got a list of nice eligible players and I keep looking at it and think “Wow this is a list of nice eligible players but not a list of great players.” And there’s not much coming along next year (1908). I will have to deal with Wilbert Robinson as a player. He’s in the modern Hall, but primarily as a manager, not a player. He’ll be one of the first people I will have to look at and seriously separate his playing from managing skills (McGraw will be another). At this point I’m more inclined to put McGraw in over Robinson based solely on playing skill (which doesn’t mean I’ll put McGraw in as a player). 5. Learning anything? Yes, quite a bit. As mentioned in 2 above, Hamilton is a great example of how this exercise is supposed to work. He was well-known and appreciated just after his retirement and within a few years (say 1920 or even earlier if you’d like) he’d dropped into obscurity. I haven’t done a lot of looking at the 1920s view of 1890s players because I’m supposed to be looking at 1907 views of players, but I wonder if the advent of Ruth and the homer relegated a lot of these guys to the dustbin of history (Is that a neat phrase or what? Wish I’d invented it). The great change in stolen bases that began in the late 1950s brought his name back to prominence and you’ll note he finally makes the real Hall of Fame in 1961, which is way too late. Also I’m noting how much the modern stats change the way we look at players. Again using Hamilton, I note the modern stats concentrate his numbers in such a way as to emphasize he scoring ability and his general hitting skills much more than his stolen bases, which predominate in the 1905 period. I’m also noticing, as I’ve mentioned before, how absolutely random the available stats are in the first decade of the 20th Century. They’re all over the place. Some players have a lot, others not so much (and it’s particularly true in the American Association) and sometimes one guy will have a stat and another guy on the same team won’t have that same stat. Makes it difficult to compare directly, so I’m finding myself using more reporting than I might normally use. Additionally it’s interesting how much the statistics differ in the era. By that I mean that I find one player credited with a specific number for a stat, then later find the same player with a different number of the same stat. Makes it kind of interesting to figure (so I tend, if there is a discrepancy, to go to Baseball Reference.com and use whichever number they use). 6. I’m also noticing the amount of mythology growing up about the game. The Comiskey story about inventing playing off the base is one example. Of course we’re reaching the period of the rise of the “Doubleday Myth” for the invention of baseball, so I suppose I shouldn’t be surprised. You are currently browsing the Verdun2's Blog blog archives for September, 2014.